It must be the week for scarlet since I see that Kimberley, our host for the Thursday Feature, has also featured something equally bright this week from her garden. Her choice is bee balm (Monarda), but the cardinal flower (Lobelia cardinalis) also gives a bright punch of red to the late summer garden. My own slightly undernourished cardinal flower. Cardinal flower is a native North American wildflower and its color and flower shape are tailored to attracting hummingbirds. Red is a color for bringing in these small winged pollinators, and one can see how its bee pollinated cousin, great lobelia (L. siphilicata), would have shorter blooms and a more bee-friendly blue coloring. Both are easy in the garden and thrive in a moist, fertile soil in either a sunny or part shade location. If your garden is well suited to these beauties, the blue version has even been known to border on weedy with its self-seeding ways, but to be honest I can’t imagine them being any trouble at all to just remove. Keep in mind though that the summers in my garden can usually fry and dry even some of the hardiest members of the plant kingdom so I might not be the best judge on if a moisture loving plant is weedy! Color coordinated seating alongside a nice patch of cardinal flower at Chanticleer. The straight species of L cardinalis is an excellent flower even straight out of the forest, but over the years hybrids and selections have broadened the range of cardinal flower available to gardeners. 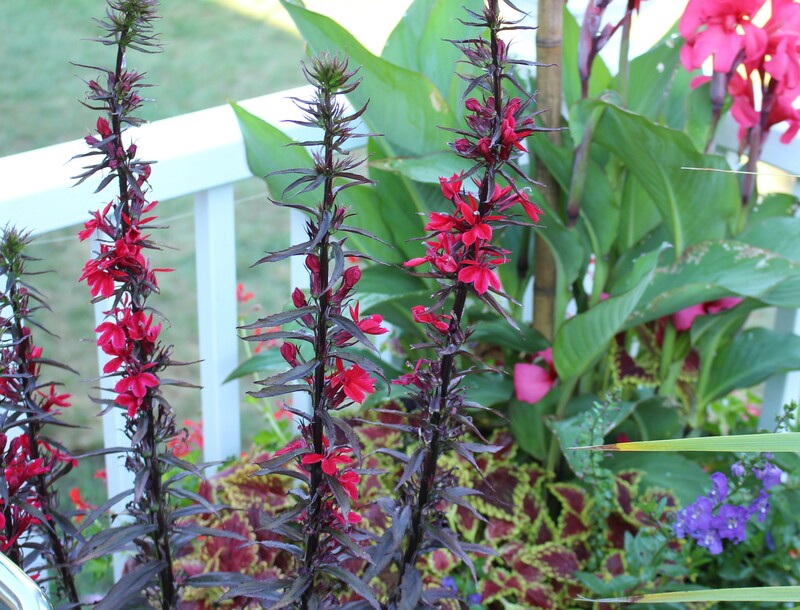 Darker foliage is always a popular look, as well as pink and purple hybrids with the great lobelia. They’re all equally easy to grow when given the moisture they need but in my experience the hybrids are no where near as hardy as the straight species(zone 7 versus zone 3). Still I showed no hesitation when I saw this maroon leaved plant for sale this spring. Even as a likely annual it’s worth the money I spent on it… although honestly I expected the flowers to be denser. A dark foliaged Lobelia cardinalis in bloom on the deck. I’m not totally sure I’ve ever seen the hummers on this one, and I wonder if some nectar production was opted out of when they selected for dark leaves. I’d love to have a bunch of these scattered throughout the garden but there are only a few spots where I can keep an eye on them often enough to keep them from drying out completely. That’s just me though, if you have a reliably damp spot or even poorly drained spot which kills off many other plants, I would jump on the chance to try out a few cardinal flowers. They may even self-seed and you can imagine the show if that happens. Give them a try and also give Kimberley a visit to see what other late bloomers are featured this week. It’s the downside of the summer, and a fresh and new bloomer at this time of year is always welcome. This entry was posted in birds in the garden, late summer, native plants, perennials, thursday feature and tagged cardianl flower, flowers, hummingbird, native plants. Beautiful, although not hardy here, I lost all mine one winter! I can’t believe you lost them all! There must really be a range of hardiness since some of mine also just disappear over winter while others are indestructible…. until a summer dry spell. Great colour, but like you it really needs too much water to survive here. This plant wouldn’t even make it past May in your garden! I love the red of these flowers – it is usually the dark leaved ones that you can buy here. I have tried them several times, and although they are usually great the first year I have never managed to get them to succeed the second year. They seem to survive the cold, but it is the slugs and snails that make real short work of the new leaves and in the end kill the plant. They are quite pricey to buy as an annual unless you get them on offer somewhere, but maybe worth growing your own if you have a greenhouse. They are stunning plants. I didn’t realize they were so attractive to slugs, but then on the other hand your voracious slugs seem to be an entirely different breed! I was lucky enough to find the dark leaved one at a great price and don’t even mind if it fades away…. but having it settle in and return would be fine with me as well! Really lovely colours with that dark foliage. As Annette says above, sadly the slugs would eat them overnight in my garden! I am so glad slugs re not much of a problem here. I think it’s partly the dry soil, partly the lack of decent mulch, but I’d like to think the snakes and toads help as well! My favorite vendor at our farmers’ market here keeps trying to sell me some Lobelia, but I really don’t think I’d be able to keep it moist enough. The lasagna garden would be a no-brainer place for it, but I just don’t remember to water up there consistently enough! Sure is pretty though . 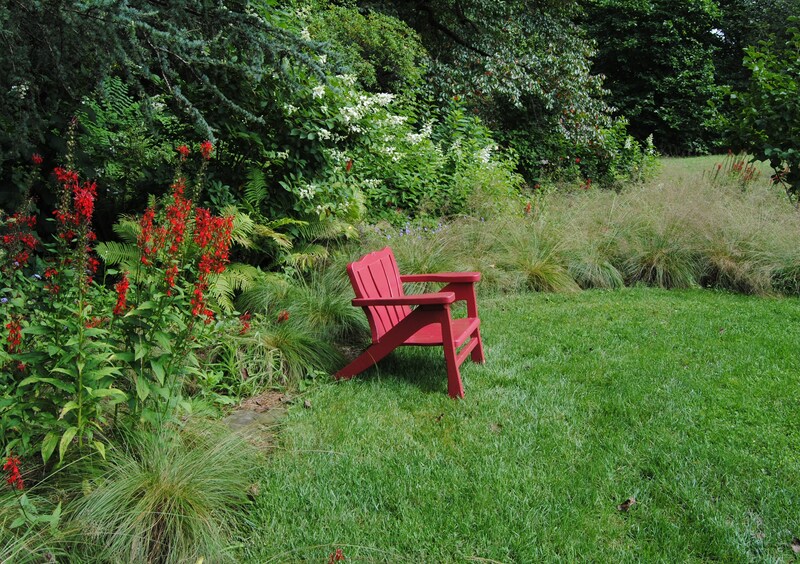 . .
Also, I saw the picture with the Lobelia and the red chair and thought, “My, what a lovely setting Frank has made!”, and then I read that it was at Chanticleer. Aren’t you happy to know that someone could easily mistake a Chanticleer garden for your own? I wonder if you could find a damper spot at the base of your rock wall? I guess all the ferns make it appear to be wetter than it actually is though, if you can grow things like roses and such there it really wouldn’t be as damp as these like. Still, mine do suffer through a little drought here and there. It doesn’t make them happy at all but they survive. It is a particularly good cultivar. Sometimes the red is rather dull, but certainly not this one. I will have to make sure I save a few seeds and spread the rest far and wide to see if I can find another acceptable spot. I can’t imagine ever having too much or getting tired of this plant. These are beautiful! I found a blue one in my shade garden recently that I don’t recall planting. I think it may have hitchhiked in on another plant. It was a happy surprise! 😀 As a gardener, I know exactly what you mean – the many surprises of gardening. I have red lobelia in my rain garden and river bed and I just love it! But it does need to be moist. 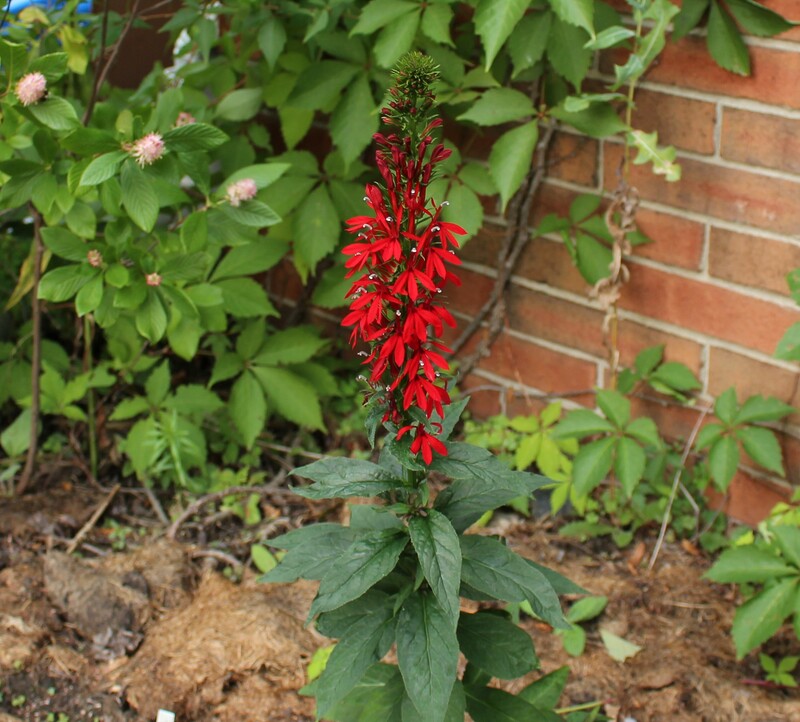 Your raingarden sounds like the perfect spot for these red lobelias. It’s basically a streamside or ‘ditch’ plant anyway. btw have a great school year!